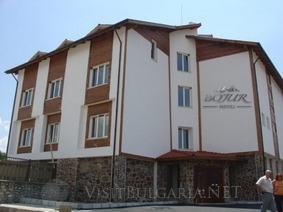 Location: Hotel "BOJUR”, part of BOJURLAND apartment complex, is located in the center of Bansko just a short walk away from the famous taverns, entertainment and shopping area and 10 minutes drive from the the main lift station. Only 150 kilometers away from Sofia and 6 kilometers from Razlog, the hotel is open to visitors all year round and offers excellent conditions for recreation, sports, tourism, business meetings and company events and celebrations. Accommodation: The hotel offers its guests comfortable and fashionably furnished rooms and apartments as follows: 3 apartments, 2 meisonettes and 19 double rooms. Each apartment offers a TV set, mini-bar, telephone, and wireless Internet access. Spa & Wellness: All guests of hotel “BOJUR” can also benefit from the free use of the “BOJURLAND’’ spa and fitness facilities.